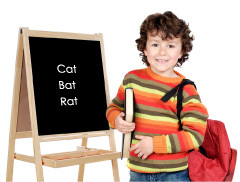 Students will learn to recognize and spell sets of words with r-controlled vowels. Students will become familiar with r-controlled spelling patterns. When the letter r follows a vowel, the vowel is usually forced to change its sound. That’s why we call it the “Bossy R.” In most small words with one vowel in the middle, that vowel has a short vowel sound as in the words bad, hen, sit, fox, and fun. Listen to how the sound of the vowel changes if we replace the last letter of each of these words with the letter r: Fat changes to far, cat to car, hen to her, sit to sir, fox to for, fun to fur. The song Bossy R familiarizes students with the sound and spelling of common words with r-controlled vowels. They will learn that the sound /ar/ is usually spelled with the letters a-r, but the sound /er/ can be spelled with any vowel preceding the letter r. Examples: a-r (dollar), e-r (swimmer), i-r (bird), o-r (motor), u-r (nurse), or e-a-r (earth). The sound /or/ can be spelled o-r, but is can also be spelled a-r (warm), o-a-r (board), o-r-e (chore), or o-u-r (pour). The sound /air/ can be spelled a-i-r, but it can also be spelled e-r-e (there), a-r-e (dare), or e-a-r (bear). Because there are so many variations, students need to become familiar with the look of familiar words, rather than memorizing spelling or pronunciation rules. Note: If you do not have the CD or Mini-Charts, you can still teach this r-controlled vowels lesson plan using the folk tune listed on the Bossy R Song Lyrics page. You can create your own mini-charts using the words in bold print letters in each verse of the Song Lyrics. Order our cost-saving Volume 2 Combo online. On Mini-Charts p.26-27, cover each word’s letters after the vowel with a sticky note. Write the letters s, b, t, n, and ff on the notes stuck to p.26. Write the letters t, k, t, n, and s on the notes stuck to p.27. Listen to CD Track 5 (Bossy R), pointing to the words on the Mini-Charts as they occur in the song. Play CD Track 5 again and ask the students to join in the singing. Allow some students to point to the Mini-Charts words as they are sung. Play CD Track 5 again (Spelling Families) and allow students to point to the target sets of words on the Mini-Charts while singing. Practice singing Bossy R daily for a week. Then try singing the song without hearing the words, using the instrumental track (Track 6). Allow different students to point to the Mini-Charts words while singing. Help students create other sets of rhyming words for the song. Make 6 copies of Mini-Chart template p.104 and allow students write in the new sets of words. Examples: /er/curve, nerve, serve, swerve, nurse, purse, verse, worse; /ar/art, cart, dart, part, cart, heart, harp, carve, starve; /or/pour, tore, wore, sore, court, short, fort, wart. /air/chair, hair, glare, there, cared, scared, shared, stared. Place these pages back-to-back in page protectors in a 3-ring binder. Then sing the song with the instrumental version (Track 6). Do a dictionary search for words with r-controlled vowels. Try searching for these sets of words without telling students how they are spelled in advance: artist/war, borrow/worry, there/were, course/our, early/ear, actor/porch. Discuss the common letters (in red) in each set and compare how those letters sound in each word. Find words with r-controlled vowels in newspapers, magazines, and advertisements. Cut out these words. Sort them into piles based on the way they sound, not the way they are spelled. For example, dollar and worm would go in the same pile because they both have the /er/ sound, but farm and warm would go in different piles because farm has the /ar/ sound and warm has the /or/ sound. Create a bulletin board or “word wall” containing words with r-controlled vowels. Cut out a picture to represent r-controlled sounds. Examples: /er/ sound-turtle, /ar/ sound-car, /or/ sound-door, /air/ sound-bear. Under each picture, paste cut-out words from newspapers, magazines, and advertisements that have the same sound (not the same spelling). After many words have been posted, discuss which spellings are the most common for each r-controlled sound. Students pass a spelling test on the words from Mini-Charts pp.26-29. Order our cost-saving Sing Your Way Through Phonics Volume 2 Combo online ($33.95) containing the CD, Mini-Charts, Song Lyrics, and Teaching Suggestions – everything you need for this lesson! Or, print out an order form to mail/FAX to us.